They came flying over the sea: horse-sized insects in battle armor. Eyes like red coals and hungry jaws. They chewed through our trees, our homes, our bodies. Anything the touched, they consumed, heedless of our misery. But we drove them back in the end. Victory! We have stacked and burned the bodies of the strange invaders. We have buried our dead and made songs for our heroes. It’s time to put these dark days behind us. Tonight we celebrate victory. Apart from the rest of us, one old warrior stands at the ocean’s edge, scanning the horizon with doubtful eyes. You’ve heard the word remission before, probably in association with cancer. Remission means the subsiding or diminishing of a disease. Full remission is distinct from a cure because while the disease is no longer detectable, there’s always a chance it could reoccur. This is true of many types of cancer, and of some types of bowel disease. Still, even with that distinction, in cases of chronic or incurable diseases remission is great news indeed. Today I’m happy to report that my wonderful friend, who has been battling acute leukemia since November, got news a few days ago that the leukemia’s completely undetectable in her body for the first time since the battle began. Full remission! And the timing couldn’t be better. Today she’s entering the hospital to begin prepping for her bone marrow transplant next week. There is no better time to do a transplant than when the disease has been so thoroughly beaten into the ground. The cool thing about bone marrow transplants? When successful, they can actually cure leukemia. Not just put it into full remission; cure it. That’s why I’m so enthusiastic about the bone marrow registry and highly encourage you to consider joining it, or the branch in the country you live in. I think cicadas make for a good metaphor for remission. 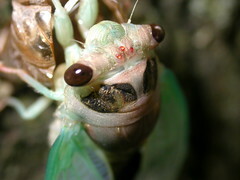 Cicadas have a unique life cycle. They spend years and years living underground and only emerge to mate, lay eggs, and die. Then their grubs go underground for up to 17 years before they emerge again. As with any incurable disease, they’re likely to reappear after being completely gone for years and years. Beautiful. Have you ever witnessed a brood of cicadas emerge? I wanted to drive around and look for one this year, but just barely missed the window! There’s a rather eerie parallel between cicadas and another 17-year mating event: High School prom night. Fun to watch that great video while imagining tuxedos, gowns, and limos.